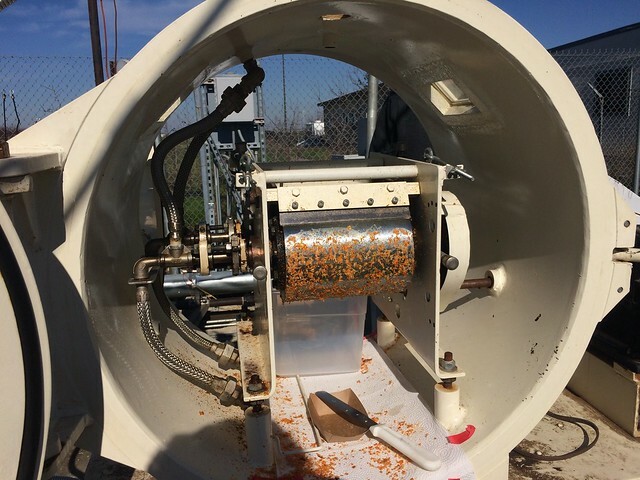 Dried tomato pomace product ready to be scraped off the solar thermal drum dryer. Research by scientists with USDA and the University of California-Merced (UC Merced) showed that energy from heat derived entirely from the sun can be used to process pomace into a drier, lighter coproduct. Consumer markets are available, but stabilizing pomace currently presents a big hurdle for processors, she says. Typically, wet pomace is only available a few months during the harvest season and molds if stored more than several days. In contrast, dehydrated pomace could be stored for use throughout the year. However, dehydration would require a lot of energy from heat—creating a demand for alternatives for better energy for heat, which currently comes mostly from natural gas. 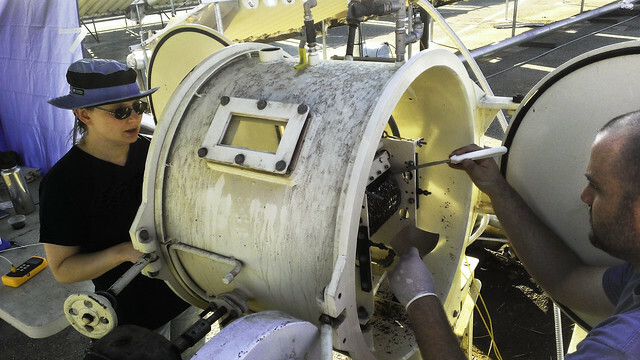 To address this need, USDA and UC Merced scientists demonstrated that a solar thermal-powered drum dryer can process prune and tomato pomace into a dehydrated coproduct that’s easier to handle and store. The project, funded by the California Department of Food and Agriculture, demonstrated that the solar technology works efficiently with whatever sunlight is available, even on cloudy days, Milczarek says. Pomace is applied to the dryer, which heats and presses the pomace into a thin dehydrated layer. In addition, because all the heat needed for the drum dryer is supplied by the sun, the pomace can be dried and stabilized without generating carbon emissions. Following this successful proof of concept, several California processing companies have expressed interest in trying solar technology on a larger scale, Milczarek notes. ARS scientist Rebecca Milczarek and University of California-Merced graduate student Jonathan Ferry collect dried prune pomace from the solar thermal drum dryer. That's so cool. I get my tomato pomace and lay it out on a stainless steel baking tray (don't use aluminum with tomato*) and bake it off before freezing.